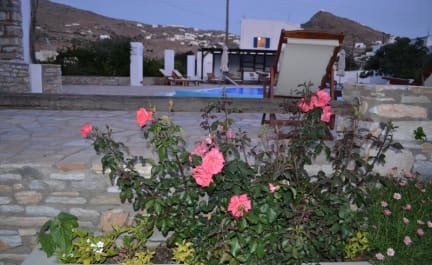 Nestled in the peaceful Kampos Valley within walking distance from Ios port and Yialos beach, Brothers hotel offers you comfort and quality to ensure that your stay with us will be a memorable one. Our family-run hotel has 17 spacious rooms to choose from, including family and studio apartments. Each of our rooms has a private balcony or veranda with views over the gardens, the pool or mountain. After breakfast relax at our beautiful swimming pool where we can provide a range of refreshments and snacks, or take a stroll down to the long and sandy Yialos beach where the Port is one of the largest natural harbours in the Aegean. Sit at one of the many bars, cafes or restaurants and watch the boats gently sail in, or hop on the bus up to the Village (Chora) where an abundance of life awaits you. The pretty village of Chora is a maze of whitewashed streets, shops, restaurants and bars. All of our rooms are equipped with: Daily maid service, private WC and shower, air conditioning, television, refrigerator ,free WiFi Internet access and private balcony or veranda.